I know I’ve been promising this update on the garlic for over a week now, and some of this information is already a little bit out of date. Still, there are some interesting differences that we’re seeing! This is the Purple Glazer, a Glazed Purple Stripe hardneck variety. 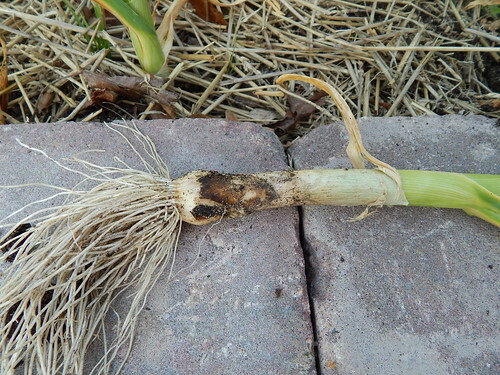 It was just starting to bulb up 10 days ago, and there was no sign of scapes or of much die back on the leaves. In the picture it looks like maybe one leaf was starting to die. 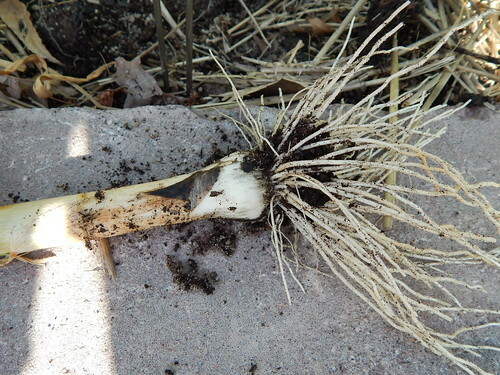 Next is Maiskij, a Turban semi-hardneck garlic. Supposedly the name means “May,” which might explain it’s early character. 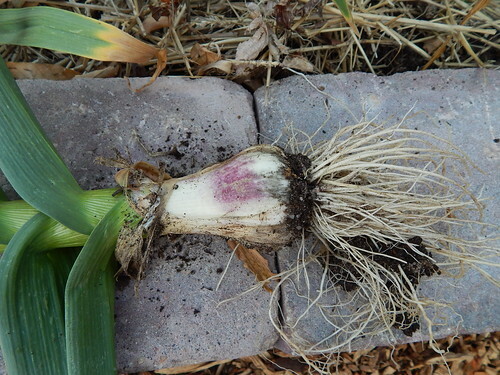 The bulb is a good size and has a very attractive purple color on the developing bulb. It had about 3 leaves yellowed when this picture was taken, and they are getting very close to 5 leaves that have died back now. (5 dead leaves is the trigger for harvesting and beginning the drying/curing process.) It was also just starting to put up scapes (it is finished with scapes now). 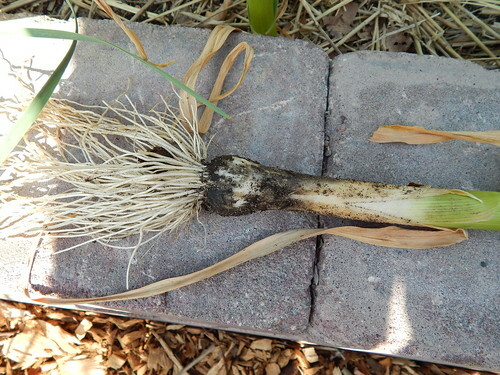 Turbans sometimes don’t produce scapes, so I was a little surprised to see them. This is Siberian, a Marbled Purple Stripe hardneck variety. As you might guess from the name, this one prefers colder climates. It had not bulbed up very much and most of the leaves are still looking very green. The stalks are definitely bright green today, and there have been a few scapes on them just this week. The S & H Silver is a silverskin softneck variety. Silverskins don’t typically do as well in this part of the country, but we wanted to try one anyway. You can see that there hasn’t been much bulb development yet. Silverskins do not have scapes. The leaves are a paler green than others, but I don’t know that it means much. 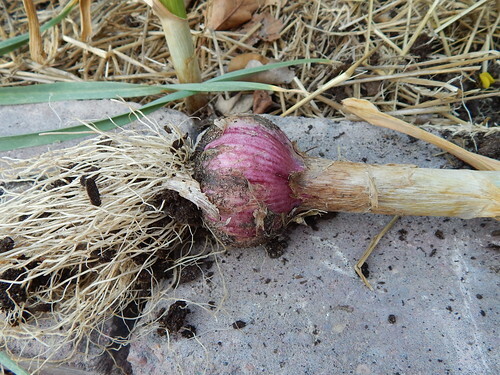 The Killarney Red garlic plants look a lot different from the others. The way the leaves are arranged looks more like a leek, and is kind of reminiscent of a pineapple plant. Killarney Red is a Rocambole hardneck variety, which is also supposed to do better in colder climates. I’m not complaining about how it looks though. It’s already bigger than some of the varieties that I know people have had good luck with. It is also just now (yes, I had to get up, go outside, and look at it again) kinda sorta maybe thinking about putting up scapes and starting to yellow off some leaves. This is Persian Star, one of the Purple Stripe hardnecks. 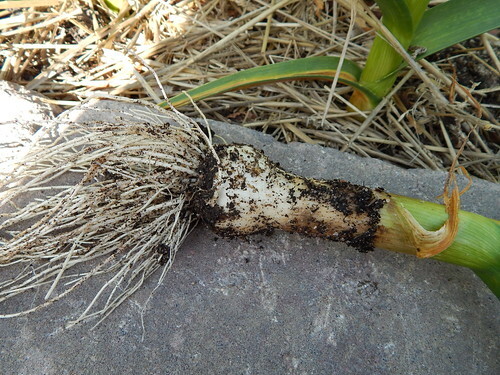 Clearly not much bulb development here and the stalks are also really skinny. I was expecting this variety to do well, but the plants look the weakest of any of the varieties, and the germination was poor last fall. I don’t know if the seed stock is to blame or if it is just the variety in our conditions. (This is why you are supposed to do a real experimental trial for multiple years, ideally in multiple locations.) It looks like it might be starting to die back, which is unfortunate. It is currently putting on scapes. 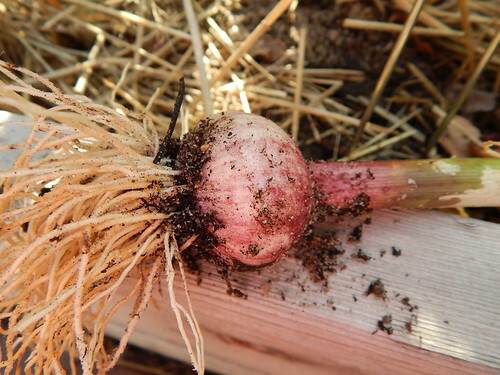 Chesnok Red is another Purple Stripe garlic, but is much stronger than the Persian Star. 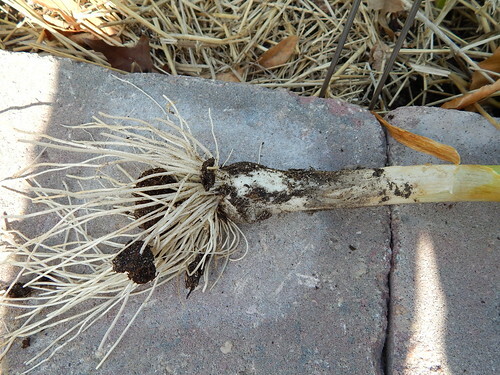 It is tall, dark green, and has thick stalks. 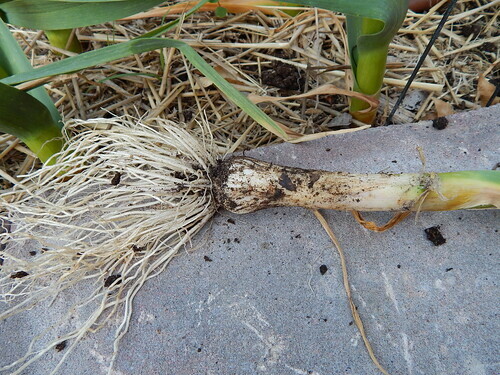 The bulbs hadn’t developed much as of 10 days ago, but it is starting to put on scapes now. The difference between Chesnok Red and Persian Star are just night and day. Music is Porcelain hardneck variety. I know a couple of growers that really like this variety here. It is big, tall, dark green, and has nice thick stalks just like the Chesnok Red. It was showing more bulb development at photo time, bigger than most of the others except for Maiskij and a couple I haven’t shown you yet. It is also putting up scapes this week. The Ferganskij is another Marbled Purple Stripe hardneck, like the Siberian. This variety originally came from Uzbekistan though, which is a very different climate than Siberia. More like here. That said, the vigor of the plants is more similar to what I’m seeing from Persian Star. The plants are shorter and have smaller stalks. The color of the plant is a little better that Persian Star, but I’m not hopeful. This is the Inchelium Red, an Artichoke softneck variety. This one is much better than the other softneck, S & H Silver. 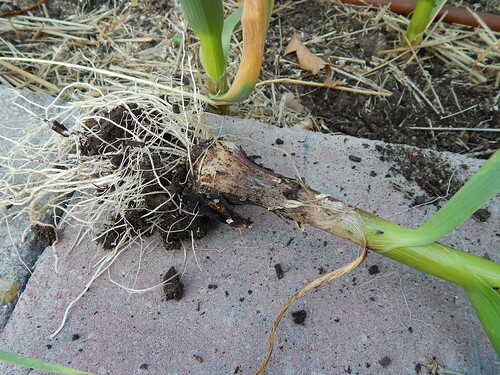 It has more bulb development than most of the others, and is just now starting to die down a little. As a softneck, it doesn’t have scapes. 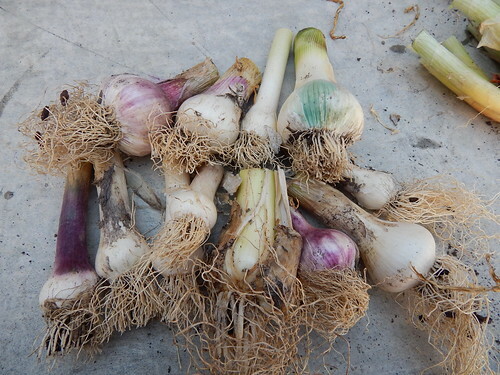 Sonoran is an Asiatic hardneck type of garlic, and it is also one of our early maturing garlics, along with Maiskij. The bulbs aren’t as big here, but isn’t that color gorgeous? This variety is supposed to do well in the desert southwest, which would explain why it is doing well so far. Ajo Rojo is a Creole hardneck variety, and I’m really excited that it looks so good! It is technically a zone 7 variety…it prefers warmer winters, but it has such great color. 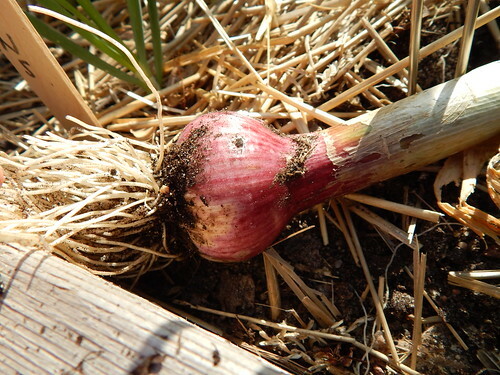 The bulb was almost as big as Maiskij when I took the pictures, and the color on Ajo Rojo is even brighter. This variety is also supposed to tolerant heat and drought better than average. (Not that we’ve had tons of heat this spring.) It is getting close to the dry down stage as well, and we’ve gotten most of the scapes from this variety. This is the whole group after they sat out in the sun all weekend, then got rained and hailed on. No, that’s not recommended practice. You can see that Maiskij got sunburned pretty badly and turned a little bit teal, which I thought was strange. We’ve got 2-4 more weeks before it is really time to harvest! We have some pretty interesting differences in the mid-spring timeframe. All that remains is to see what the differences are as we harvest. 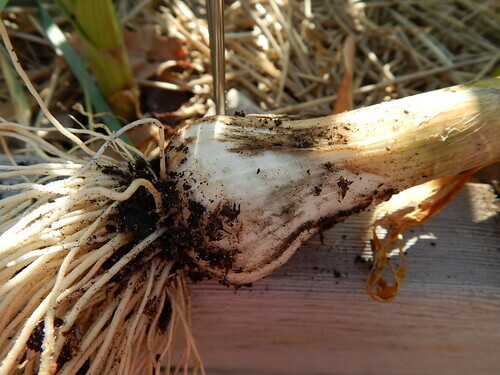 Posted on May 29, 2013, in Around the Garden and tagged garlic, Spring. Bookmark the permalink. Leave a comment.